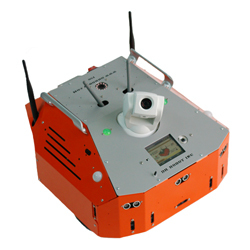 Sentinel3 is a wireless networked autonomous mobile robot platform, featuring 24 x7 collision-free autonomous navigation, vision-landmark localization sensor(indoor GPS), autonomous docking and recharging, high resolution pan-tilt-zoom color camera (max 704x480, 10X optical zoom), two-way audio, tele-operation and remote monitoring. Sentinel3 is built with durable aluminum chassis; with payload capacity over 15Kg at the body weight under 6kg. Navigation and Localization providing collision-free point-to-point autonomous navigation. The vision-landmark base indoor localization (indoor GPS, position/orientation) sensor and the landmarks together provides precise position and direction information covering every inch of the floor. OS Independent Application Development Tools allow simple motion and sensor control command and full support of high level application development using raw data packet protocols. High level ActiveX controls and MSRS (Microsoft Robotics Studio) support are also available for rapid development under Windows OS. Comprehensive Circuit Protection includes battery over-charge, battery over-heat, motor over-heat and motor over-load protection. Various Upgrades includes 5 DOF servo arms with gripper, camera on arm, stereo camera head, laser scanner (range finder), multiple cameras and long range RFID reader. 320x240 Color Touch Screen is capable of displaying video, playing audio, and running web applications. Lightweight and Large Payload Capacity Max payload of 15Kg (Optional 40Kg) with body weight under 6Kg. Tele-Operation and Remote Monitoring via Internet through the Dr Robot Remote Client Program. Extended Operating Time 2 hour nominal operation time for each recharging (Sentinel3 with standard accessory and battery pack). Upgrade options: power and battery systems for 6, 12 hours operation time are available. For more detail information, please refer to Sentinel3 User Manual.